Yes, you read that right. Out of the whole world’s prison population, a quarter of all that is incarcerated right here in the land of the free. That is almost 2.3 million locked up. Incarceration in the United States is one of the main forms of punishment, rehab, or both. Americans have a peculiar view on crime and punishment. Americans are locked up for crimes such as writing a bad check, to using drugs. What’s strange is that this wouldn’t really be such an issue in other nations. Yes it isn’t something that’s welcomed, but American prisoners are kept incarcerated far longer than any other prisoners in the world. Criminologists and legal scholars around the world are mystified and shocked by the number and length of American prison sentences. When you consider China, which is four times more populated than the United States, is the distant second with only 1.6 million people in prison. The United States comes in first on a more important list on the prison studies center, the one ranked in order of the incarceration rates. That means that population aside; it has 760 people in prison or jail for every 100,000 people. 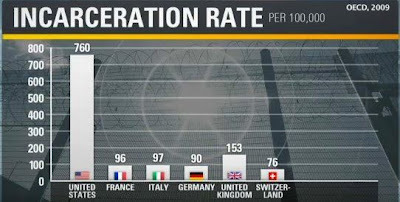 (If you only count adults, one in 100 Americans is imprisoned.) Essentially that means incarcerated individuals per-capita. What about other nations, you ask? How bad are they? Well how would you feel if we told you that only one other country came close? It’s Russia, with 627 prisoners for every 100,000 people. The other countries are immensely lower. 5. The American temperament and the lack of a social safety net. Even democracy plays a huge role in this: As judges, many of whom are elected, another American anomaly – yields to populist demands for tough justice. So judges often judge based on the publics approval rather than based on justice. Regardless of the reasoning behind it, as you see from the numbers & charts above, the gab between American justice and that of the rest of the world is enormous and growing. There was a time when Europeans came to America and studied its judicial system and came away impressed and inspired. That time has passed. That quote was taken out of “Democracy in America”. Alexis de Tocqueville, who toured American penitentiaries in 1831. This quote is the farthest thing from relevant today.